John Blichmann, the head of Blichmann Engineering joins me this week to discuss brewing high gravity beers. John covers a wide variety of topics including compensating for reduced efficiency, hitting your gravity, doing a split mash, balancing your beer, yeast starters and aging your big beer. We discuss some of the beer styles that are typically categorized as “high gravity” beers. High gravity starts around 1.080 SG. John explains why you get lower efficiency when brewing a large beer and how you need to use more grain for all grain brewing with a big beer. We discuss scaling a regular recipe up to be a “big beer” and how specialty grains, hops and other ingredients come into play. John talks about how mash tun volume can also be a limitation when brewing a “big” beer as most mash tuns can’t hold all of the grains needed. 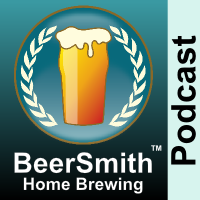 We talk about John’s recent experiments brewing using a “split” mash with his BrewEasy system. Split mashing involves doing two separate mash processes on the same wort to create a high gravity wort in a limited volume mash tun. We discuss mash pH and some considerations around balancing mash pH for a big beer. John explains why aeration and a strong yeast starter is very important for high gravity beers. We also discuss yeast selection and stuck fermentations. We talk about why big beers often require additional aging and conditioning as well as longer fermentation times. I am in need of knowing how to achieve high gravity beer from mashing to filtration.